The APR news crew with the RFK Journalism Award in Washington D.C.
APR’s winning entry included four stories from its yearlong rural health investigation, covering Alabama’s rural hospital shortage and obstetrical care shortage, the 20th anniversary of President Bill Clinton’s apology for the Tuskegee Syphilis Experiment, and a report on the potential of telemedicine to link doctors and patients in rural Alabama. At the time APR recorded its series, seven rural counties in Alabama did not have a hospital; since then, the number has increased to eight. Furthermore, only 16 Alabama counties have hospitals capable of delivering babies, which does not help the studies which have ranked Alabama as having the highest infant mortality rate in the nation. APR’s investigation into these facts provides a critical analysis of the problem of health care in rural Alabama, shedding light on just how dark the situation is. In fact, the documentary produced from its news series was recognized by human rights organization Robert F. Kennedy Human Rights with the prestigious national Robert F. Kennedy Journalism Award. The members of the Alabama Public Radio news team are Pat Duggins, news director; Stan Ingold, assistant news director; and Alex AuBuchon, news host and reporter. The national Edward R. Murrow awards will be presented in New York City in October. They are named for the internationally renowned broadcast journalist whose name they bear. 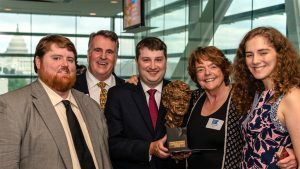 Established by the Radio Television Digital News Association in 1971, these annual awards recognize the best electronic journalism produced by radio, television and digital news organizations around the world. Alabama Public Radio is a network of public radio stations licensed by The University of Alabama and located in Bryant-Denny Stadium’s Digital Media Center. Its affiliation with the College of Communication and Information Sciences gives students opportunities for practical training in a variety of production activities.